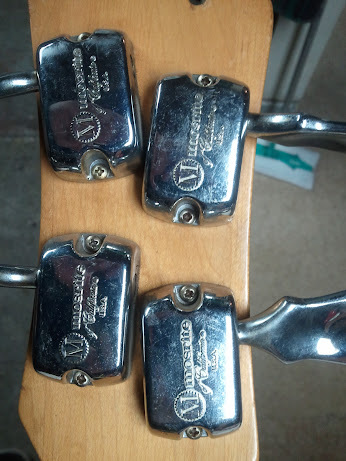 I've had this old Mosrite bass of my dad's for years and I always thought it was great looking but it's never played well. The pots are corroded and every note produces a pretty gnarly hiss. Cosmetically it's not in very good shape either. Anyway, I'd like to know if anyone could shed some light on this particular guitar (year, model, etc. ), and has anyone restored one of these before. 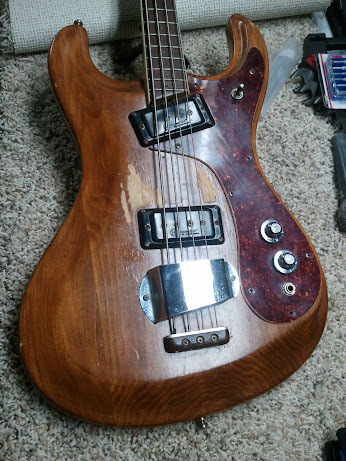 I did a little research on Mosrite basses, but never saw one this combo of pickguard/body color. I doubt this is a serial number but I dunno what it could be. I didn't bother taking the neck off when taking these pics so I don't know if there is any dating info on the heel or in the pocket. anyway I didn't research this all that well, just thought I'd get some opinions and see if anyone had experience with Mosrite. Definitely from the early-mid 60's. It is a refin, the original color was probably white since it has a tort guard but you can never be sure considering you could order everything custom from Mosrite. 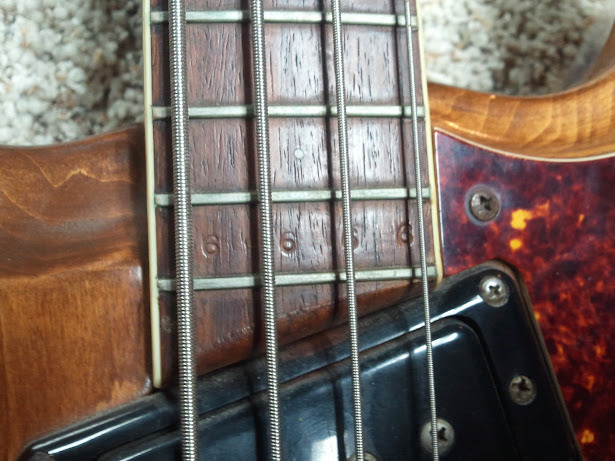 The numbers stamped at the bottom of the neck on the fretboard is the serial number, that's how they did it. Fun guitars with fast necks, I honestly would just get some new pots in there and leave it be. You can always find plenty of replacement parts on eBay. I for one would love to see it in it's white and tort glory, and that serial number is amazing. Try contacting Semi's daughter (I think she now runs Mosrite) or drop a line at Tym's Guitars if your in Oz. They should be able to tell something about it, but to me that serial number might mean it could be quite special or it might be just a happy accident. Filly-Fuzz wrote: That thing is badass! Its a really nice bass, I'm somewhat familiar with mostrites. There are a bunch of websites dedicated to specific model mostrites where you could get info, or do what I do, go on ebay check out a bunch of pictures of ones on there and see if yours matches any. 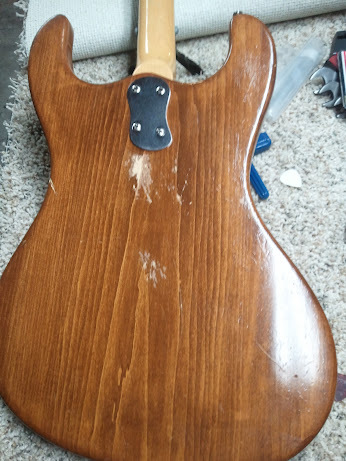 Its a great looking bass, I would honestly restore the whole thing. Its been refinished anyways, and its always cool bring an old instrument back to its hayday. I'd get it check out to see if they can savage any of the pots, you probably what to stick with period correct parts if possible, also if you don't just make sure you store all the original stuff safety somewhere. Best of luck! 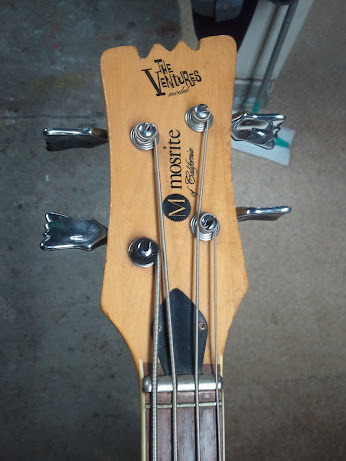 I have a Ventures Mosrite Bass. Single Pickup version; Candy Apple Red. Same era, though. I like yours alot. If it was mine, I'd set it up correctly with new flatwounds and clean up the electronics. Does yours have the original case? Mine does. They have value too, ya know. it does have a case that fits it perfectly, though it's in worse shape than the guitar itself. Can't say for sure if its original though. I'll try and post some pics later. I'd love to get it refinished to the original white. The only reason I didn't think that the serial number was a serial number was that it was 6666. Pretty weird. If nothing else I'm gonna replace the pots and see what I can do about getting the body refinished. It really does have some pretty nasty gouges I didn't detail in the photos though. Thanks for the responses. Just don't ever doubt how cool that bass is. It is awesome. I agree with the other folks about how sweet it would be in white, but be patient and find a solid and reputable refinisher so you can get it right the first time! funsize wrote: it does have a case that fits it perfectly, though it's in worse shape than the guitar itself. Can't say for sure if its original though. I'll try and post some pics later. I'd be careful about replacing the pots. In all likelyhood, the pots themselves are OK, and it's a wiring issue, such as grounding, cold solder joints or misplaced connections. Original pots are valuable and are a major contributor to a vintage instruments worth. 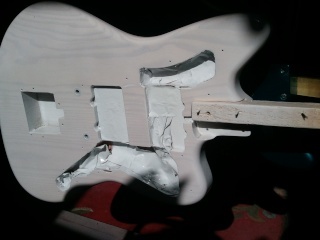 btw....what is it with Mosrite cases..?...they seem to disintegrate faster than other brands. Is yours really a Mosrite case? Mid 60's Mosrite cases are usually a sort of brownish fake-alligator, but otherwise are assembled pretty much like Fender cases of the same era. I have two... both are fuzzy orange inside with a narrow rectangular lidded compartment in the lower left corner. yeah the case sounds exactly the same. When I checked the wiring everything looked good including the ground. The pots, however, were really corroded. It's possible i guess that I could just clean all the oxidation or whatever is on them off and see if that get's rid of the noise. Any leads on what I might use? It appears to be pretty caked on.